New York's burgeoning brisket scene continues to grow. Smorgasburg favorites Mighty Quinn's Barbeque have turned the old Vandaag spot on Sixth Street and Second Avenue into their first brick-and-mortar spot. Fans of Mighty Quinn's Texas-Carolina barbeque hybrid can now get their brisket on seven days a week. I stopped in to get my first taste. The large corner space has been refitted with dark wood, metal and concrete. The space is sleek and minimally done but comfortable. Large windows along sixth street lighten up the room. Standard seating takes up the front of house while the back of the room near the food counter has window seating and a large communal table. 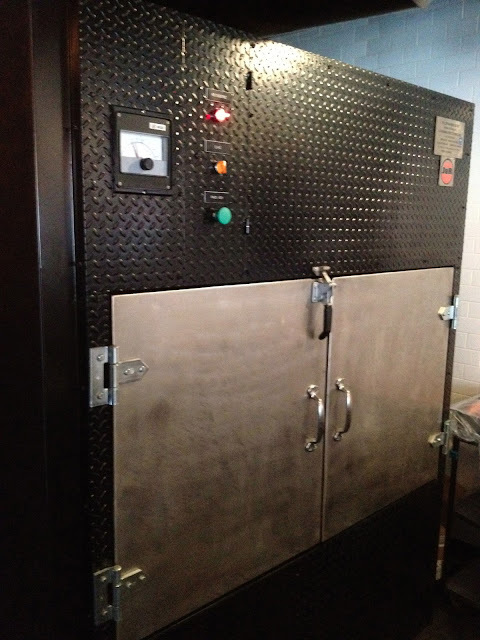 The main event at Mighty Quinn's is the smoked meat and their beast of a smoker has pride of place behind the counter. It immediately grabs your attention. A giant rack of hardwood sits close by, fuel for this monster. Like any self respecting BBQ joint, Might Quinn's offers counter service only. You order, get your tray full and pay. First up is the meat menu. Brisket, pulled pork, smoked sausage and spare ribs are available in a single serving, "naked" or as a sandwich, or by the pound. Beef rib and half chicken are only available as a single serving. Once you have placed your meat order you move onto add-on's and sides. You start with the free add-on's to go with your sandwich. Pickled cucumbers, pickled onions or pickled chilies for some heat. Two styles of coleslaw (creamy and vinegar) are available and can be had as a side or as an add-on. Other sides are Burnt End Baked Beans, Sweet Potato Casserole and Edamame & Sweet Pea Salad. Along with water, sodas and home made iced tea Mighty Quinn's also has a nice selection of beers in bottles and on tap. So let's cut to the chase. What did I go for? Brisket of course. The brisket sandwich to be exact. An over-sized brioche style bun is filled with the house brisket. Moist, lean and smokey, the brisket is light and brightly flavored. You will be asked, as I was, if you want burnt tips. You will of course say, "yes, please." For the add-ons I went with the pickled cucumbers (cool and sweet), the pickled onions (slightly sour with a soft edge) and creamy slaw. Every table has a bottle of the house barbeque sauce. It is a nice blend of a tomato and sugar style sauce with a vinegar based sauce. Use it. The brisket sandwich is a winner. No surprise since this is what the empire is built on. The brisket is delicious to begin with and the add-on's are no afterthought. This is one example of the benefits of the pickling craze. The add-on's raise the brisket sandwich (or any other meat I would imagine) to another level. The meat is warm, rich and hearty. The sides are cool, crisp, light and bright. Any combination would be a winner. 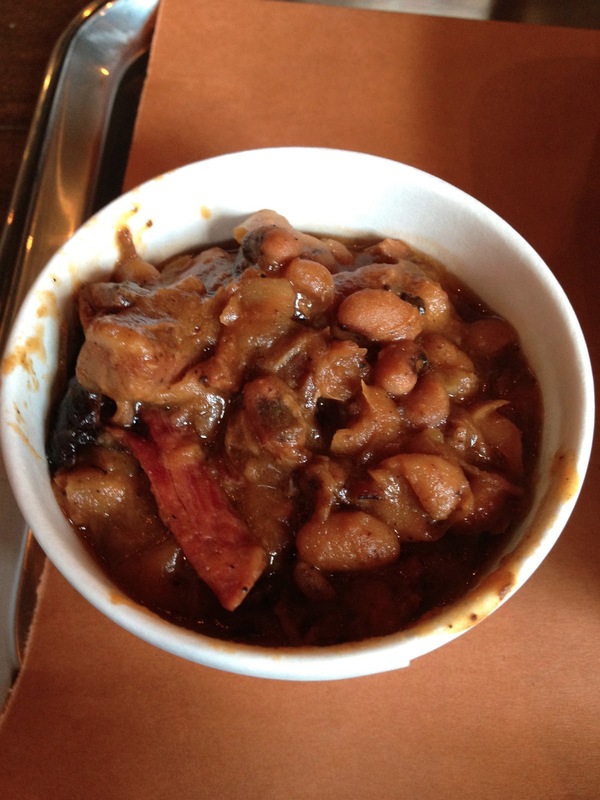 I also went for a side of Burnt End Baked Beans. Smokey, meaty goodness. You may think that a brisket sandwich is more than enough brisket. You are wrong. Get these. The jump from food truck or flea market food vendor to an actual restaurant is becoming more and more common. That does not mean it is easy. 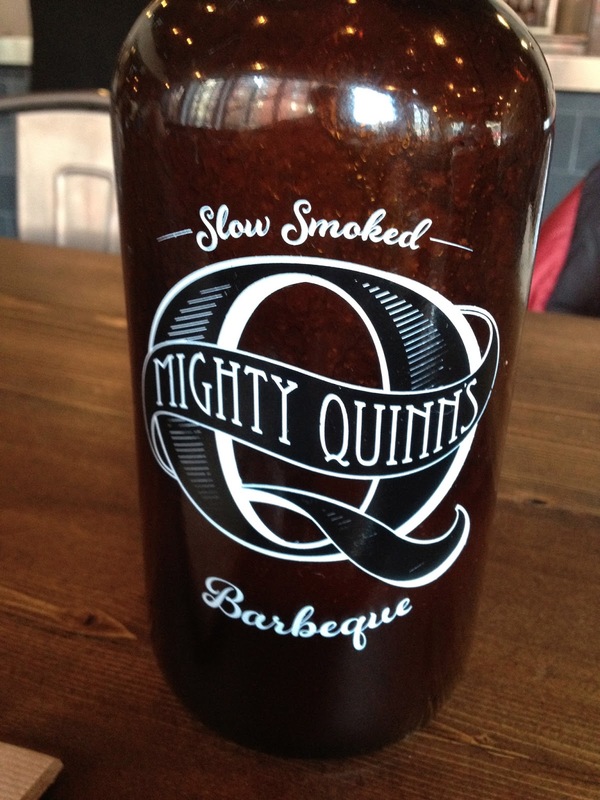 At first glance it appears Mighty Quinn's has made the jump and landed on their feet. 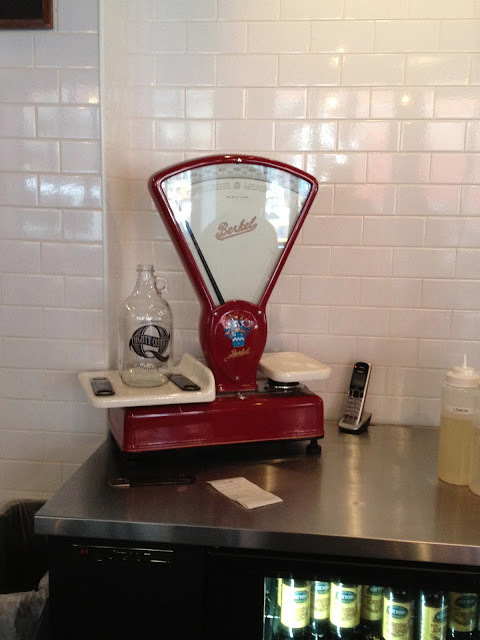 The restaurant looks good, the staff is incredibly friendly and helpful and the food delivers. I cannot wait to get back and try some of the other meats and sides, although I am worried I will just go for the brisket again and again. Not that that would be so bad. 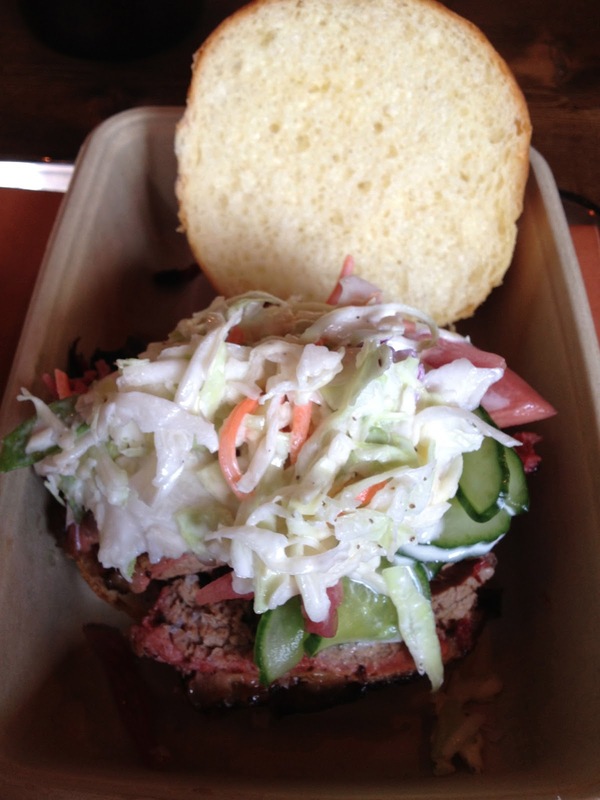 Was there Saturday per Sean's recommend and his review of brisket is on the money. Sides too. Place was jammed in pouring rain. Perfect spot for refuge from the elements and indulgence in BBQ. This restaurant is on my list. List of must essayhave places to visit and taste foods. Red Dead Redemption 2 Online money generator for you at www.rdr2money.online ! Enjoy! Clash royale generator online at www.clashroyale-gems.online ! Hurry up!